Information on power outages including current outages, possible causes and handy tips. The map displays current power outages across the CitiPower and Powercor network. 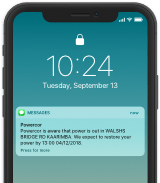 Want to receive outage notifications?